One of the reasons why Agesearch is still alpha is that it sometimes returns false positives e.g. when stratigraphic terms are ambiguous such as 'Canadian'. I am testing this by feeding Agesearch with terms which should have no chronostratigraphic context, such as 'beer' or 'pizza' etc. After it surprisingly turned out that beer does have a stratigraphic context, I formulated some more provocative queries. The definetely funniest result was Ordovician as the best stratigraphic context for the query 'bible genesis'. Ha! in stratigraphic terms this would indeed be a good compromise between the creationists and scientists point of view ;). Here is a really good analysis on the current status of the geoblogosphere, an initiative of the NOVA geoblog. Interestingly, the majority of geo bloggers are students, folowed by faculty staff and industry employees. And if you take the numbers on slide 27 and weight bloggers with 'professional background' with against the rest you get a ratio of approx. 1:1! P.S. : A very good compilation of geoblogs can be found at geoberg.de which offers a categorized list of geoblogs. After reading this enthusiastic blog on OneGeology I was curious how cool OneGeology really is and tried to play with it a bit. The first thing I got from OneGeology was a "Your browser is not supported" message: "This application is optimized for IE6, IE7, Flock 1.2 and Firefox 2". Good to know... but not too cool: I am using Firefox 3. So I had to switch to Internet Explorer and a nice Google-Maps like satellite image was shown by their browser plug-in after I entered their 'portal'. My plan was to get a geological map of the area around Moixent (Valencia, Spain) where I did the field work for my diploma thesis. I zoomed to Spain to get an overview of the geology of the prebetic mountains. Still no geological map appeared. It took me a while to discover that (and where) I had to add additional layers. Finally, a nice geological map appeared ... but.. now the satellite map layer disappeared and I had no idea where to zoom next. Here I stopped playing with OneGeology. I would say OneGeology still is a cool project, I know how hard it can be to bring people together to share data. The list of contributing parties is impressing and really a big success for OneGeology. However, for field geologists (and others) the tool is far from being useful in it's current state. The map is much too small, a legend is missing, there are little export options and the overall usability could be improved. Their press release states that OneGeology aims to do "the same for the rocks beneath our feet that Google does for maps of the Earth's surface". There is still a lot of homework to do to reach this goal. 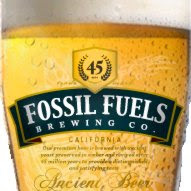 This blog on Geology News reports about beer which is brewed by 'Fossil Fuel Brewing Co.'. The company produces beer with yeast which was extracted from the gut of an Eocene insect found in a piece of fossil amber. This is a screenshot of Snet's latest toy: Agesearch. It is a demonstration mashup of basically two web services, the Google API as well as our own Ageparser REST service. I will post more technological details about all this soon. Agenames is a scientific web search engine which allows to estimate the "stratigraphy" of web search results. It scans found web pages for names of stratigraphic units, e.g. 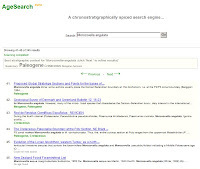 litho-, chrono or biostratigraphic zones, and displays the best matching stratigraphic context of the search term. It can be useful if you need a quick estimate on the stratigraphic context of e.g. a geographic region or a distinct fossil name try e.g. this search for Morozovella angulata. You can also do some fun queries, e.g. to give an overview on the stratigraphic expertise of one of your colleagues if you enter his name.